Love the classic look of Vespa scooters? Needing to scratch your itch for 1960’s and 1970’s nostalgia? Don’t feel much like spending $4,899 USD on a 2015 Vespa Primavera? No problem, just 3D print yourself one. 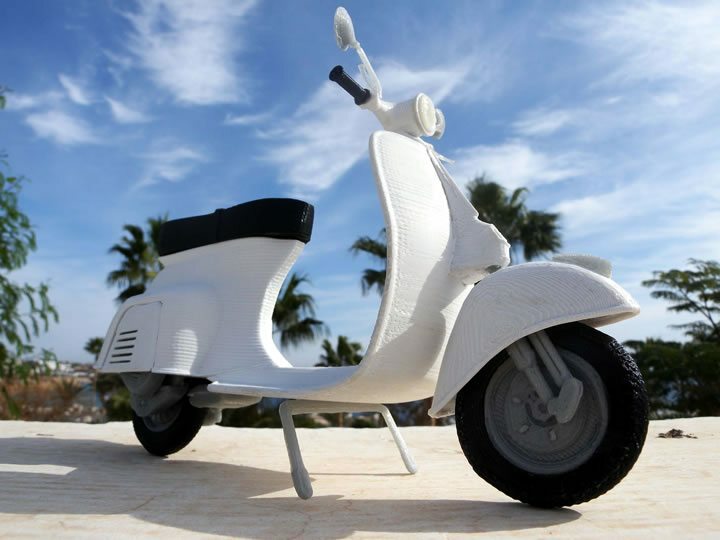 If Vespa, nostalgia, Italy’s “Dolce Vita”, or 3D printing are your thing, read this. Two months ago we posted about Jonathan Brand’s 3D printed motorcycle – the world’s first full size replica of a motorcycle made on a 3D printer. A 3D printed Honda CB500. Now it’s time for something smaller. 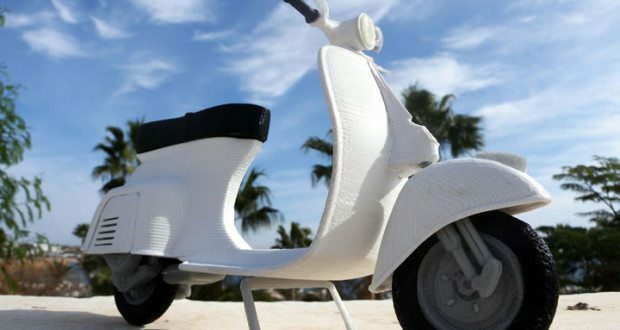 Maurizio “Mao” Casella is showing off his newest creation, a 3D printed Vespa Primavera 125cc scooter. “Mao” launched another Italian inspired vehicle 3D print earlier, a FIAT 500 model kit. “This is the scooter from when I was sixteen.” Maurizio shared. The downside wasn’t immediately clear, so let me be blunt with you before we go any further: Casella’s 3D Vespa isn’t full scale size – it’s toy size. Now before your groan and hit back on your browser, chill out, this is still cool. 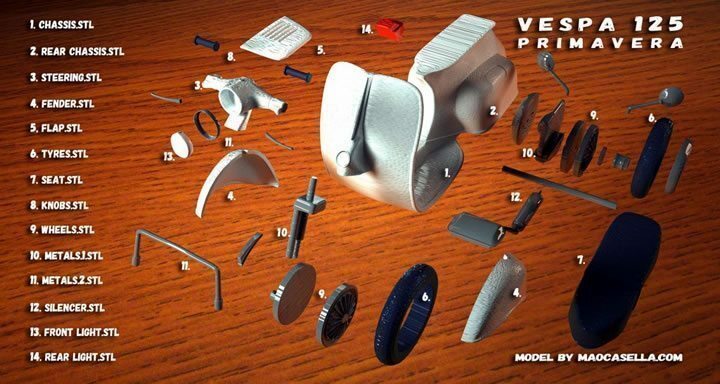 Casella’s 3D printable Vespa is made of only 14 files which you can download and print yourself – which is great, if you’re into that sort of thing, but I’m not. I’m a motorcyclist, and you probably are too. To folks like us, what’s really important isn’t the toy size scooter, but what it means to riders. If we can print small scale scooters and cars, or full size motorcycles, how long until we can print our own fairings, fenders, clutch and brake levers, or frame sliders? The times they are a changin’, friends, and I for one can’t be more happy to see two wheeled vehicles getting so much attention in the 3D printing realm. It can only be good news for us riders in the long term. I’d really love to hear your thoughts on these 3D printing projects, and the future of at home 3D printing of motorcycle parts for our own bikes. Will we see at home 3D printing of motorcycle parts in our life time? Next: What Do You Love Most About Motorcycles? and where would that be downloadable from ?